If you’re looking for a cool or romantic way to get to Fenway Park, try those fun guys at Boston Pedicab. As you may know, only rookies drive their car to Fenway Park, or anywhere in Boston, for that matter. Narrow streets and world-class congestion make the public transportation system pretty popular in Beantown. But public transit has its drawbacks, especially for those using it to get to a ballgame. I can tell you from the experience of nearly having my face pressed against a window for entire Green Line rides. Trains coming to and leaving games at Fenway Park get mercilessly jammed with Red Sox fans. The perfect size vehicles for Boston streets. 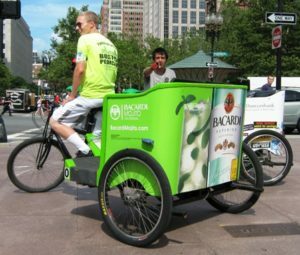 Boston Pedicabs is a local outfit that employs college students, who pedal bicycles attached to rickshaws around the city. There are plenty of them available near Fenway, but the gentleman I e-mailed asking where best to find them (forgive me for losing the e-mail with his name) informed me that the Prudential Center garage some blocks east of Fenway is a good spot. The Pru lot is much cheaper than the lots closest to Fenway, and the Center is basically a mall with quite a few good pregame dining options. The fellows riding the bicycles are friendly and will have a conversation with you as they’re pedaling you through murderous traffic to the park, and you can look around at the city rather than waiting for the driver in front of you to finally move. Best of all, they’re free. But not really. The Boston Pedicab drivers subsist entirely on tips, so don’t be stiffing them. That’s just one cool way to get to Fenway…but you should really know every way to get there, because Fenway is a challenge. 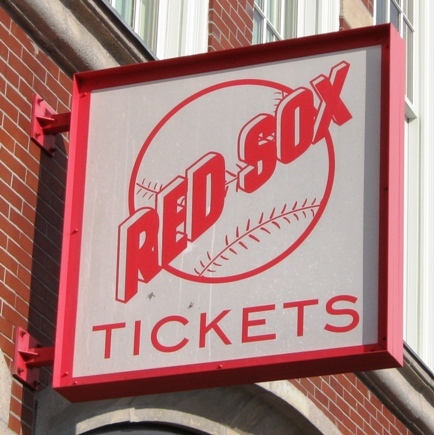 Can You Bring Food Into Fenway Park?